The annual springtime tradition of prom is already a big deal – a crucial over-the-top social milestone for most high school students. Some students fuss over cummerbund choices, others fret about dinner plans – and some worry if their choice of a date will be met with acceptance, or conflict. 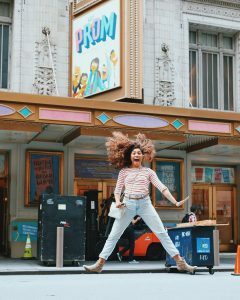 The new musical The Prom opening on Broadway this fall follows the story of a lesbian student who just wants to take her girlfriend to prom in a small, close-minded town that won’t allow it – and the band of Broadway stars who try to make it happen. Musical theatre alumna Jerusha Cavazos ’14 first had a role on the show Atlanta on FX in April, performed in Jesus Christ Superstar in Chicago through May, and is now making her Broadway debut in The Prom surrounded by industry greats. Even with such a successful whirlwind year, she stopped by the Performing Arts Center to give new Musical Theatre students a masterclass and take a moment to reflect on her roles, her journey, and her own prom. Tell us about the show and the role you’re playing? I’m so grateful for my experience at UCF. I think that any program you enter as an actor becomes what you make of it. And I made the most out of my time at UCF. I took advantage of the many recourses that UCF has. I did independent studies with professors and worked on perfecting skill sets I knew I needed to make it. Here’s the great thing about UCF: if you really want it, the professors are there to help guide you to do so. You just have to show up. Casting Call: See What Our Theatre UCF Alumni Have Been Up To!